Hi, I’m Terry Whin-Yates from Mr. Locksmith. I have a Rant today. 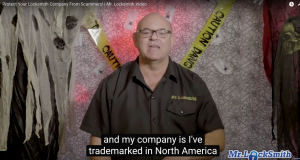 I’ve been dealing with scammer locksmiths for years and also, sometimes legitimate locksmith companies have copied my name, copied my websites, copied my blog, and copied my advertising. I expect it out of scammers, I don’t expect it out of other legitimate locksmiths. The one main thing I’ve done to protect myself and my company is I have trademarked in North America my company name. As I expand or try to expand, when I get these scammers using my company name on fake addresses, I can deal with them very, very quickly with my trademark. A few emails and letters off to Google, Facebook, Yelp, legitimate companies, I send them the information that this website or this company is infringing on my trademark. It is dealt with quickly. They remove the website, they remove the data, they remove the images. So, even if you’re a little guy just starting out, one of the most important things I recommend is trademark your company. 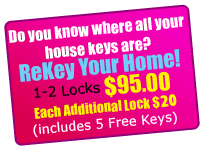 It can protect you against the scammer locksmiths. Also, when you get somebody who’s made a mistake and they copied your name because they think it’s cool, you can deal with them. If you have to, you can deal with them through the courts as well. The quick, easy way is your, is get your lawyer on it, give a “Cease and Desist” letter or Court order. It can be expensive but that’s what you have to protect your company. So again, protect your company against the scammers, also protect it against other companies and get your company trademarked. For Locksmith Franchise and Licensing Opportunities go to Mr. Locksmith Opportunities.